DIE Mercurii, 26 die Septembris. 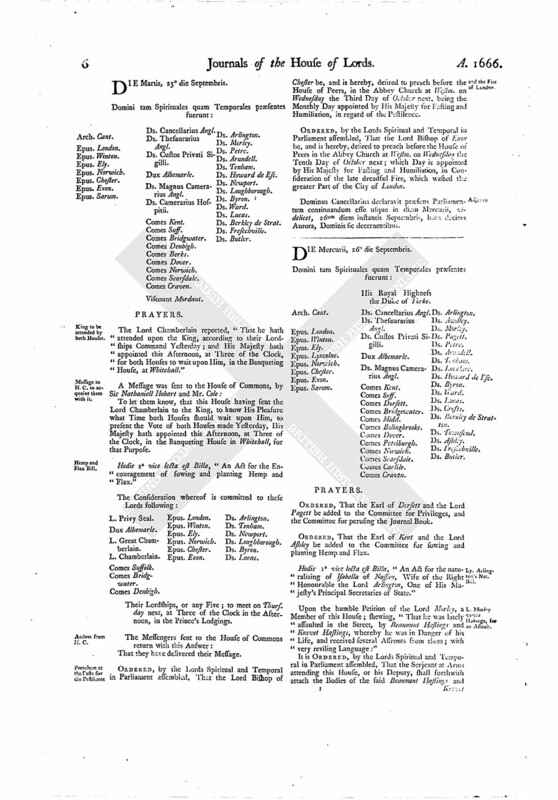 ORDERED, That the Earl of Dorsett and the Lord Pagett be added to the Committee for Privileges, and the Committee for perusing the Journal Book. ORDERED, That the Earl of Kent and the Lord Ashley be added to the Committee for sowing and planting Hemp and Flax. Hodie 1a vice lecta est Billa, "An Act for the naturalizing of Isabella of Nassau, Wife of the Right Honourable the Lord Arlington, One of His Majesty's Principal Secretaries of State." 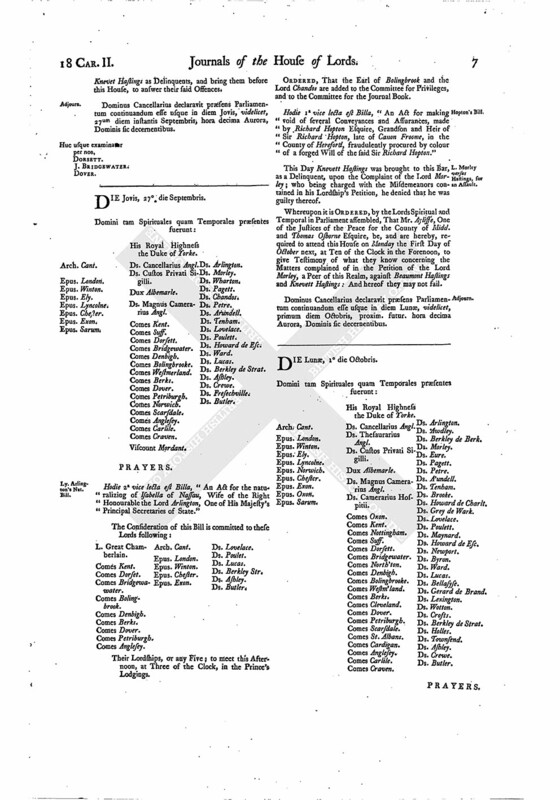 Upon the humble Petition of the Lord Morley, a Member of this House; shewing, "That he was lately assaulted in the Street, by Beaumont Hastings and Knevet Hastings, whereby he was in Danger of his Life, and received several Affronts from them; with very reviling Language:"
It is ORDERED, by the Lords Spiritual and Temporal in Parliament assembled, That the Serjeant at Arms attending this House, or his Deputy, shall forthwith attach the Bodies of the said Beaumont Hastings and Knevet Hastings as Delinquents, and bring them before this House, to answer their said Offences. Dominus Cancellarius declaravit præsens Parliamentum continuandum esse usque in diem Jovis, videlicet, 27um diem instantis Septembris, hora decima Aurora, Dominis sic decernentibus.